MAIT - Glen Allen VA | "21 CEU Training for Therapists in Encounter-centered Couples Therapy"
Glen Allen VA | "21 CEU Training for Therapists in Encounter-centered Couples Therapy"
The Tikkun Learning Center and the Virginia Institute for Pastoral Care invite you to join Hedy Schleifer, MA, LMHC, for a three-day clinical training in Encounter-centered Couples Therapy. 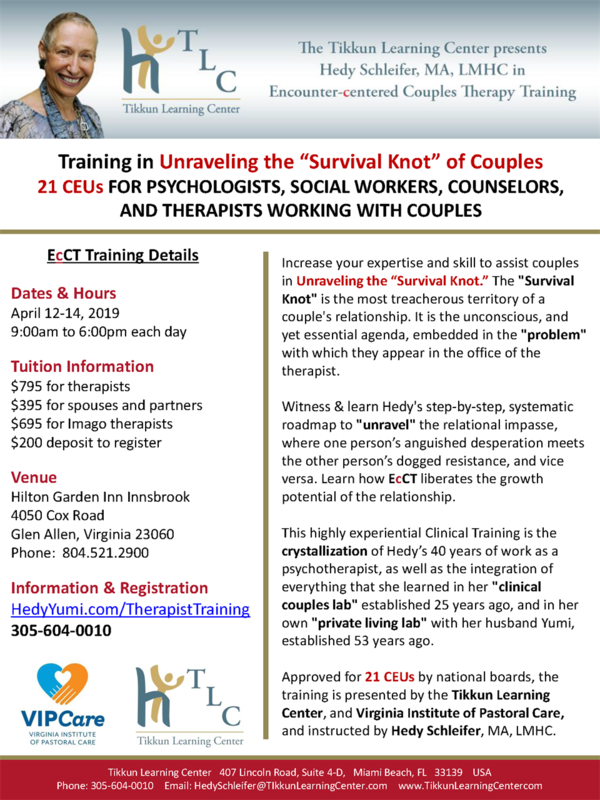 Increase your expertise and skill in assisting couples in Unraveling their "Survival Knot.” The"Survival Knot" is the most treacherous territory of a couple's relationship. It is the unconscious, and yet essential agenda, embedded in the "problem" with which they appear in the office of the therapist. Witness and learn Hedy's step-by-step, systematic roadmap to "unravel" the relational impasse, where one person’s anguished desperation meets the other person’s dogged resistance, and vice versa. Learn how Encounter-centered Couples Therapy liberates the growth potential of the relationship. This highly experiential Clinical Training is the crystallization of Hedy’s 40 years of work as a psychotherapist, as well as the integration of everything that she learned in her "clinical couples lab" established 25 years ago, and in her own "private living lab" with her husband Yumi, established 53 years ago. The course is approved for 21 CEU credits by national boards and is open to therapists, counselors, coaches, organizational development professionals, and pastoral counselors.